LAU has unveiled a revamped website with a fresh new look, friendlier features, new contents and a renewed focus on its users. Beginning to portray LAU's rich student life was one of the objectives of the redesign. Interactive campus maps now deliver detailed information about our two locations. Notice something different? The main LAU website now has a fresh look, friendlier features, some new sections, and improved old ones. The best part about the redesign, according to those who were closely involved in the project, is that it’s all about the users. Although it’s the fifth time the website gets a makeover since its launch in late 1997, such comprehensive structural changes have never been implemented before. The overhaul gave a completely new look to the homepage, while keeping some of its old highlights. In addition to a slideshow, the latest news, and a list of upcoming events, the page now includes illustrated links to new sections such as an admissions guide and a special website introducing LAU to prospective students. “We had to redesign and restructure the whole website to make crucial information available and easier to find,” said Karina Rodriguez, assistant director of the Marketing and Communications Department that planned and implemented the project. As the web manager, Rodriguez supervised the team’s tasks that were divided into organization, content, design, and development. To keep readers up-to-date with various LAU developments, the news section was organized into browsable categories and was enriched with brief, timely items along with the longer news stories. Readers are encouraged to send story ideas and comment on articles. 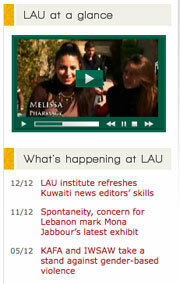 The “About LAU” section was enriched with expanded historical, statistical and campus information. Interactive features make it faster and more fun for visitors to browse the additions. The Facts and Figures pages slide by, image collections can be seen as slideshows, the campus maps light up a building when the mouse rolls over one of its facilities, and custom-made Google maps show satellite imagery of the campuses and surrounding areas. “The site does an outstanding job of projecting LAU’s vital mission and providing those who visit it with a true sense of the university’s dynamic and vibrant community,” said Vice President for University Advancement Richard Rumsey. The revamp started in earnest in early 2008 shortly after Marcom’s establishment and the recruitment of key web team members. In the initial phase, the team studied user needs, performed an extensive audit of the old website, benchmarked it against other university sites in Lebanon and abroad, and created sitemaps. A project of this scale was a challenge for the new team, but it was a necessary step considering the fast pace at which the university is evolving. The website “will pave the way for our branding initiative, which aims at reflecting the image of a university on the move, cherishing its heritage and legacy but embracing new technology and progress,” said Peggy Hanna, director of Marketing and Communications. The new design intends to reflect that identity. The color palette was lightened to bring out richer contents and special visual effects. Institutional accreditation was another main reason for the redesign. “Given the fact that divulging and publishing materials about who we are and what we do with transparency and lucidity is a requirement of NEASC, the website becomes a major vehicle to do just that,” said LAU President Joseph Jabbra. Particular attention was paid to content revision and production that required fieldwork, literature review, and compilation of scattered materials. The goals were to standardize editing, avoid repetitions, ensure accuracy, and produce easy-to-navigate guides and previously unpublished information. But the work is by no means over. “This website is a start, a foundation to build on,” said Rodriguez. Her department will have to maintain the necessary capacity to listen to users and respond to their needs quickly. Upcoming projects include redesigning the websites of the schools (except Pharmacy School’s, which was created recently) and the libraries. Marcom is also developing a plan to guide other university departments in outsourcing their web development projects.